The "New" Super Mario Bros. series doesn't feel very new anymore. Time flies, it's hard to believe but the first New Super Mario Bros game came out on the Nintendo DS back in 2006 - over a decade ago. Before NSMB came out, there actually had not been any 2D Mario platform game Super Mario Land 2: 6 Golden Coins came out on the Game Boy came out in 1992. At that point it had been 14 years and we discussed the lack of 2D Mario platformers on SM128C in 2000. After the first NSMB game, there have been three major releases - New Super Mario Bros. Wii in 2009, New Super Mario Bros. 2 for the 3DS and New Super Mario Bros. U for the Wii U in 2012, and re-released for the Nintendo Switch in 2019. If you throw in New Super Luigi U which is more like DLC stages, that's basically four games of the same series that hasn't really changed all that much. These 2D side-scrolling Mario games sold a ton and were a cash cow for Nintendo. In a way, it's nice that we are receiving regular Mario releases, it's just that they don't have much of a differing factor. These 2D games kept selling, so that's why Nintendo kept making them. The Wii and Wii U iterations can allow up to four players at a time, it's fun for parties, and it can cause chaos and destroy friendships. I'm not saying they aren't fun, but it's time to change it up. When you look at the 3D Mario side, there are major gameplay upgrades, just look at how the series has evolved from Super Mario 64 to Super Mario Sunshine to Super Mario Galaxy and now Super Mario Odyssey. These aren't just minor change but rather they are huge innovations and updates - what we don't see on the 2D titles. Notice how I don't include Super Mario 3D Land and Super Mario 3D World here. Although these games take place in 3D space, they feel much more like a traditional platformer where you are mainly trying to get to the end of the level. In addition you have to hold down a button to run, and they have more traditional powerups like the 2D sidescrollers. While these games were still fun, they just lack the innovation of what the "main" 3D series games offer. And yet they literally have "3D" in the title! Even back on the 2D titles, Nintendo can use more creativity and innovation besides the tried and true "New" Super Mario Bros. formula. But after so many NSMB titles, it's seriously getting tired and stale. While there are some differing themes from each title, for the most part they feel largely the same, and it's the same kind of experience. In contrast, for Nintendo's other franchises such as Yoshi, we've seen a lot more variance and experimentation for their 2D adventures. Yoshi has been in in a cartoonish world in Yoshi's Island, been turned into yarn for Yoshi's Woolly World, and the latest release he is in an arts and crafts environent in Yoshi's Crafted World. There's no reason that Mario keeps getting cookie cutter 2D adventures. I'm not creative enough to suggest a dramatic overhaul of the 2D Mario platformer - I'm sure Nintendo has really smart people to come up with great ideas. How about a reboot for the 2D Super Mario Bros. series? In recent times we are seeing a bit more games go back to the more pixely 16-bit style games. When done right, it can work out pretty good. 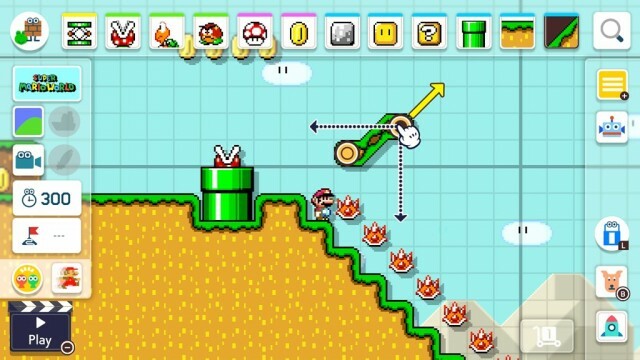 We've already seen how 8-bit or 16-bit style graphics can work on a modern gaming console in Super Mario Maker on the Wii U. While the SMB, SMB3 and SMW graphics looked for the most part the say they did, there have been enhancements such as smoother textures and a better frame rate. In a way, the cartoonish presentation is pretty solid and is a great trip down memory lane giving Mario a classic retro feel. It isn't backwards to make a 2D Mario game look more 2D. There's no reason Nintendo can't take Mario down this path to completely refresh the series.